The attorneys at O'Connor, Runckel & O'Malley specialize in defending clients accused of Driving Under the Influence of Alcohol (DUI/DWI) in San Francisco. 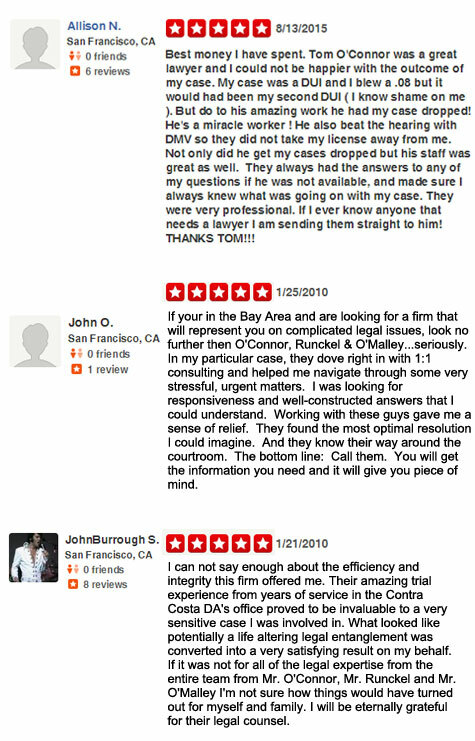 As former Deputy District Attorneys and a Superior Court Judge, with over 50 years of experience, Tom O’Connor, Jason Runckel and Dan O’Malley have extensive experience handling DUI charges. We have negotiated thousands of Driving Under the Influence cases. We have tried over 250 criminal jury trials. Whether it is a first time DUI charge or a vehicular manslaughter charge involving alcohol, the attorneys at O'Connor, Runckel & O'Malley have the experience necessary to defend your rights. We employ former police detectives to aid in our investigations. We have experts and specialists available to examine all breath and blood alcohol results. Our dedication to our clients and superior investigatory skills enable us to provide the best possible defense. We leave no stone unturned. If you have been charged with a drunk driving offense in San Francisco, hiring the right lawyer can make all the difference. At O'Connor, Runckel & O'Malley, we are dedicated advocates working to defend and protect the rights of every client. San Francisco is the financial, cultural, and transportation center of the larger San Francisco Bay Area. The 14th largest city in the United States, San Francisco, California is also one of the most densely populated. Best money I have spent. Tom O'Connor was a great lawyer and I could not be happier with the outcome of my case. My case was a DUI and I blew a .08 but it would had been my second DUI ( I know shame on me ). But do to his amazing work he had my case dropped! He's a miracle worker ! He also beat the hearing with DMV so they did not take my license away from me. Not only did he get my cases dropped but his staff was great as well. They always had the answers to any of my questions if he was not available, and made sure I always knew what was going on with my case. They were very professional. If I ever know anyone that needs a lawyer I am sending them straight to him! THANKS TOM!! !